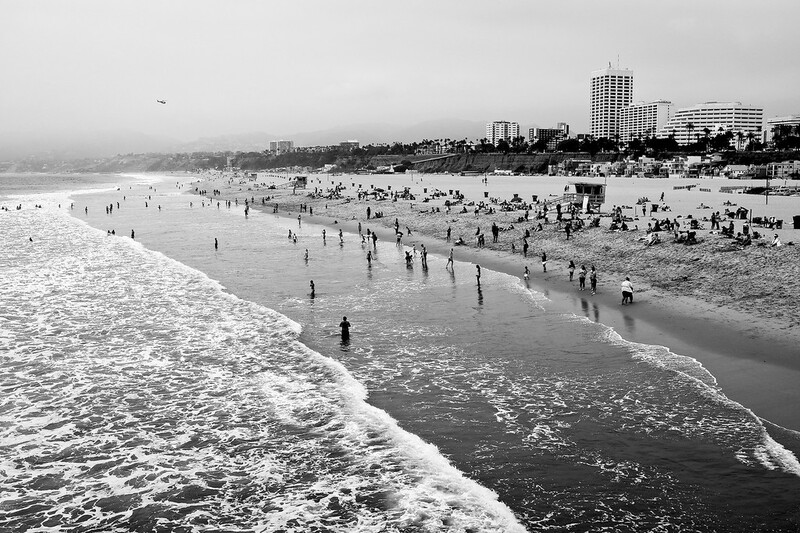 Santa Monica beach – I was surprised to see that it wasn’t packed. It wasn’t too busy. This photo seems empty to me, even though there are a lot of people in it. You should see Hampton Beach during the summer on a weekend – now THAT is packed. Here, it was delightfully….less. Of course, maybe the cloudy/foggy feeling had something to do with it. Now the boardwalk was a different story – but that’s for another day! This photo was actually taken from the Boardwalk looking down at the beach. Santa Monica Pier is the end of Route 66. I had this funny feeling – like I had “made it”. Whatever that means. What did I make? The journey? This was my first glance at the pacific ocean, my first time in California. I drove straight to Santa Monica Pier from the Grand Canyon. Then after, checked into the lodgings and explored L.A. But this was the first stop. It was both different and a little of the same as the East Coast. Different vibes, different coast line, different beach-goers. But the same sand, same touristy pier/boardwalk with rides and vendors, fast food, greasy food, etc. Definitely more surfers though. And the water was definitely warmer than New England’s chilly Gulf of Maine. Brrr!